Nick Young had a 12-point third quarter for the Lakers. LOS ANGELES – Less than an hour after their once again fallen star spoke with the media about his most recent injury, the Lakers were issued the task of hosting the Miami Heat on Christmas Day – a team they’d never beaten on Christmas. 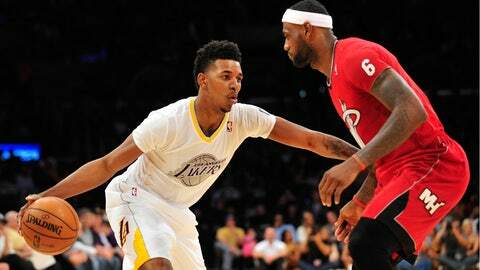 The marquee matchup of LeBron vs Kobe all of a sudden became a showdown of LeBron vs Swaggy P? The nation saw the former Reseda Cleveland High School star, Nick Young, take it to the four-time NBA Most Valuable Player for a stretch. While the Lakers watched their upset bid of the Heat denied after coming oh, so close in a 101-95 defeat in front of a sold out crowd at Staples Center. Christmas Day in the NBA is a spectacle in which new fads are often born. Teams on this day had special Christmas edition jerseys that looked more like warmups than game apparel. Players normally use the day to break out new footwear as well. Such was the case for Young. He opted for a pair of white and purple low top Jordans for the occasion. He looked good thus he thought he would feel good and eventually play good only to go through the first half with just three points on 1-of-8 shooting. So much for the new kicks. Young swapped out his shoes at halftime. With a pair of white and tan Jordans on his feet, he emerged from the locker room a new man. "The shoes wasn’t working for me," Young said. It was a 12-point third quarter for Young, fearlessly going right at James. "(I wasn’t) backing down from the challenge," said Young, who finished with a team-high 20 points in 32 minutes off of the bench. "The coaching staff has been unbelievable just working with me, instilling that confidence in me the whole halftime, just talking to me and that got me going." Added James: "We all know Nick, if he makes one he can make four or five in a row." Young’s performance provided a spark for the Lakers, who found some rhythm offensively playing with a point guard for the first time in seven games with the return of Jordan Farmar from a hamstring injury. After holding the lead for a brief period in the fourth quarter, Young hit a running jumper to pull the Lakers even with the world champs, 83-83 with 8:25 to play. Then, it was closing time. The Heat’s James, Dwyane Wade and company closed things out in front of a 18,997 at Staples Center on Christmas Day while the Lakers closer — Bryant –could do nothing but watch from the sideline. Swaggy P’s mojo had run out as well. The effort of Bryant’s teammates was never in question as the Lakers once again found themselves playing hard, only to add one more to the loss column. "I thought they battled all the way," said head coach Mike D’Antoni who was greeted by the home crowd with boos following the announcement of the starting lineups. "We had a little bit of a chance. They’re a good team so, obviously, they controlled us." The Lakers won the rebounding edge, yet that aspect of the game still failed them. The third member of Miami’s Big Three, Chris Bosh, posted a double-double with 23 points and 11 rebounds. He had four of Miami’s seven offensive rebounds. Bosh’s 23 points were tied with Wade for most in the game. The Heat outscored the Lakers 13-11 in second chance points and converted 6-of-7 second chance opportunities. Before the game, Bryant talked about his team’s rebounding woes. Once again they came back to hurt them and caused them from winning another game in which they were so close. "It’s irritating because we can do some things that could have got us a win today," D’Antoni said. "We can step it up a little bit and be a little bit tougher, especially on the boards." The team is now floating further and further away from the .500 mark. At 13-16, the Lakers are the most games they’ve been under .500 since a loss to Memphis dropped them to 4-7 on Nov. 15.